Manchester: Ole Gunnar Solskjaer has challenged Anthony Martial to fulfil his potential at Manchester United by following Cristiano Ronaldo’s example. United announced on Thursday that the France striker had signed a new contract that commits him to the club until at least June 2024, with the option for a further year. Martial, who is expected to recover from a minor training injury to play at Leicester in the Premier League on Sunday, has scored 10 goals this season, although he had gone more than a month without one before striking in the 3-1 FA Cup win at Arsenal on January 25. Solskjaer, United’s caretaker-manager, witnessed Ronaldo’s transformation from raw teenager to world-class talent while at Old Trafford. The Juventus forward, who joined United from Sporting Lisbon as an 18-year-old in 2003, spent six years with the club before joining Real Madrid. “Cristiano was the best, the way he’s changed to now, that’s part of any player’s development,” said the interim United boss. “You’ve got to model yourself on someone and you’ve got to have more challenges ahead of you. You can’t just rely on what you do now. Martial scored 17 goals in his first season with United, but has not matched that total since. He endured a difficult campaign under Jose Mourinho last season, missing out on France’s World Cup squad, and it seemed at one stage as if he might leave Old Trafford. He appears to be playing with more confidence now, and Solskjaer sees the new contract as a sign of the club’s faith in the forward. “He’s had some ups and downs at the club, he’s been top scorer, he’s been developing,” said Solskjaer. “Of course as a young lad moving abroad it’s not easy but now he knows he’s going to stay here for the coming future and I believe in him, I certainly believe in him. 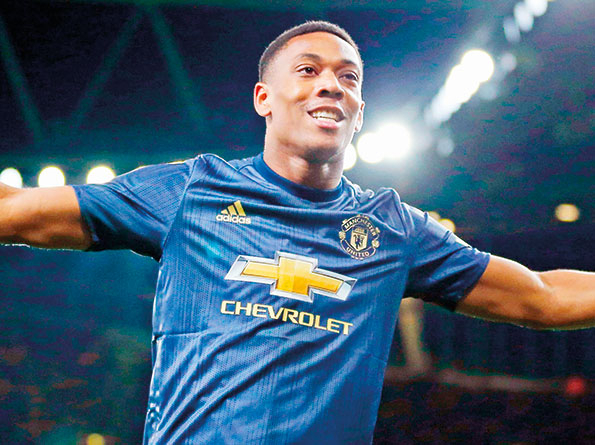 Solskjaer, a prolific striker for United between 1996 and 2007, is certain that Martial has the ability to become a 20-goal-a-season striker. “He has the capability but I’d like him to make a few more runs in behind because he doesn’t miss chances,” he said. Solskjaer hopes that goalkeeper David de Gea will follow Martial in signing a new contract.